The U.S. African Development Foundation (USADF) is providing seed capital to young entrepreneurs who are using a business mindset to solve problems like food insecurity. We sat down with USADF President/CEO C.D. Glin to discuss USADF’s role in supporting youth-led enterprise in Africa, especially when it comes to fighting hunger. In this interview, Glin discusses the unique role that USADF plays in providing catalytic seed capital to young entrepreneurs to grow their agribusiness. How does the U.S. African Development Foundation’s model prioritize youth entrepreneurship? The U.S. African Development Foundation was created in 1980 to create pathways to prosperity for underserved communities. The population on the African continent has changed drastically since that time, and we see a major need to include young people in our economic development work. We must harness their power and leverage this economic asset in order to make strides in global food security. Fortunately, USADF is designed to be nimble and move quickly to award grants and pilot projects that addresses these challenges. Our youth-led enterprise grants are unique because what we are really funding are ideas, empowering youth across the continent to think of new, innovative solutions to challenges in their communities. Since 2014, we’ve provided over 150 young entrepreneurs with seed capital to expand their social enterprises. Over a quarter of these youth-led enterprises are involved in agribusiness, so we see that young people are looking for ways to make agriculture profitable and commercial. Smallholder farming can be a powerful force in the fight to end hunger, and young entrepreneurs are leading the way. Young entrepreneurs are bringing new strategies to the world of smallholder farming and funding their ideas is essential to meeting the food security needs of a growing continent. What is USADF’s role in encouraging youth to embrace opportunities in agriculture? Youth all over the world, particularly in Africa, are increasingly finding new and entrepreneurial ways to rewrite the rules and find new ways of solving social problems. Agriculture in Africa employs over 65 percent of its labor force, but a majority of these producers are smallholder farmers with low yields and low economies of scale. USADF is attracting young people to agriculture by using the entrepreneurial spirit to commercialize small-scale agriculture into productive, profitable ventures. This way, we can not only use agriculture as the job-creation engine for unemployed youth, but also to end global hunger. What are some innovative ways that you have seen youth get involved in agribusiness? I spent the last five years living in Kenya, so I’ll use an example of a young entrepreneur named Eric Muthomi, founder of Stawi Foods in Kenya. He started his business when he noticed that smallholder bananas producers suffered from market saturation and spoilage while waiting to sell their goods. We invested $25,000 in Stawi Foods to jumpstart this agribusiness, which links smallholder banana farmers in rural Kenya with direct market access, and produces value-added products such as banana chips and gluten free flour. By buying bananas from over 400 farmers year-round, Stawi Foods protects producers from market fluctuations and can increase their household food security by creating stable incomes on which families can depend. Here we see a good example of an entrepreneurial mindset to take age-old problems-- market saturation and food waste-- and turn it into a business opportunity. These are the types of enterprises that USADF is supporting across the continent. Increasingly, youth are innovating with modern technologies to find new ways to increase agricultural outputs. 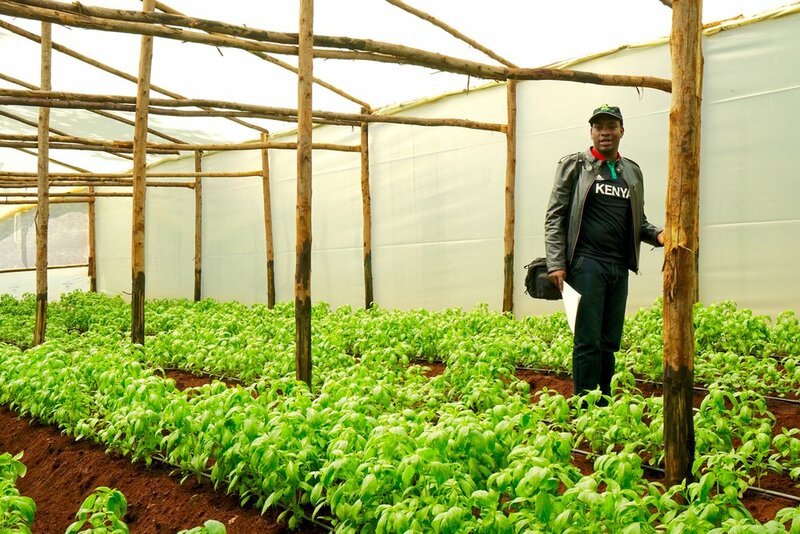 Taita Ngetich, founder of Illuminum Greenhouses, is linking smallholder farmers with “smart” greenhouse technology to help them expand their yields and increase incomes. In youth entrepreneurship, we again see the role of technology in improving food security and increasing incomes. USADF is helping to digitize and scale some of these pilot projects across bigger regions. How does youth entrepreneurship benefit both the private sector and food security? Entrepreneurs are an important part of the ecosystem to help open market opportunities for private investment. They create markets where there often are none, and help pave the way for future economic development. Consumer spending on the African continent is expected to grow by 40% by 2020, creating new markets for private investment and U.S. trading partners. The young entrepreneurs that USADF has selected to invest seed capital have already seen a return on investment: in the first year of the program, over 60 percent received follow-on funding in private investment. By investing in and engaging with youth, we can give entrepreneurs the tools they need to quickly transform their agribusiness, make it profitable, attract private investments and result in higher yields and greater food security. How does USADF partner with other organizations and U.S. Government agencies to strengthen global food security? USADF is one of 11 participating Feed the Future partners, and is helping to address the root cause of poverty and hunger at the grassroots. With the enactment of the Global Food Security Act and its implementation over the past year, USADF’s grassroots-level support has been amplified through enhanced interagency coordination. In 2016, we teamed up with the Citi Foundation to support youth-led enterprise in Africa. Together, we’ve supported 40 entrepreneurs with nearly $1 million in seed capital. These entrepreneurs have impacted over 2,000 families by training young Africans, creating jobs, and sourcing from smallholder farmers to turn agriculture into a thriving business. Why Invest in Rural Development?